Celebrating 70 years, Alberta’s Agriculture Service Board gathered nearly 500 representatives in West Edmonton January 20th-24th to network, discuss and analyze the state of our provincial agriculture and its complex challenges. Alberta’s 70 Agricultural Service Boards include producers, fieldmen, government representatives and elected officials. Under the control and governance of the provincial government, the ASBs are in place to educate the Alberta producers on the Alberta Weed Control Act, the Pests Control Act and the Soil Preservation Act. It is a lobby group that helps farmers deal with concerning issues and through resolutions drafted by the various counties, it forwards these concerns to the Alberta government. Along with several councillors, Leduc County Mayor John Whaley attended all the sessions, intently listening to the concerns expressed by ASB members. The alarming rate of the urban sprawl that threatens to swallow large chunks of quality farm land across the province, the Club Root disease that threatens canola crops in some Alberta regions and many other topics. 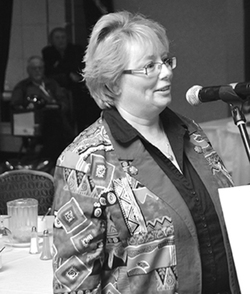 Maureen Vadnais, manager of the ASB Program, lends her tireless energy to helping producers across the province deal with their issues and communicate with the government. She gladly shared that her commitment is to educate producers on the resolution processes and her government’s response time, which it constantly strives to improve. Mr. Van de Kraats adds that all councillors are committed to sharing the resolution process and its outcome at this level, so producers and county residents can contact their division councillor if they have questions. The popular conference tradeshow involved a dozen exhibitors, including The Invasive Plant Council and ARECA. Long-time Leduc resident Janette Macdonald is ARECA’s executive director. She explains, “ARECA is a farmer-driven Alberta-wide organization that operates applied research projects and delivers information to farmers.” She enjoyed the busy tradeshow and the quality of the many questions presented to her. The Fantasyland Hotel hosted this large conference, delivering superior food and hospitality. The closing banquet featured SaFire, a dynamic entertainer who juggled, hula hooped and played with fire, engaging the audience with her fun and dynamic act. Closing the conference, a well-attended Ministers’ Forum featured three Alberta ministers: Minister of Agriculture and Rural Development Verlyn Olson, Minister of Municipal Affairs Diana McQueen and Minister of Culture and Tourism Maureen Kubinek. All three ministers were intently focused on the Q & A session, responding patiently and sensibly to the many questions posed by producers, and promising to forward the expressed concerns to other ministers better connected to the topics at hand. Questions asked at the forum’s microphones covered a vast array of topics, such as purple fuel, government planes, land use, agricultural plastics among others. All in all, this was another excellent, informative ASB conference, attended by all those who represent and protect the interests of Alberta producers and the elected officials of their respective rural counties and municipalities.